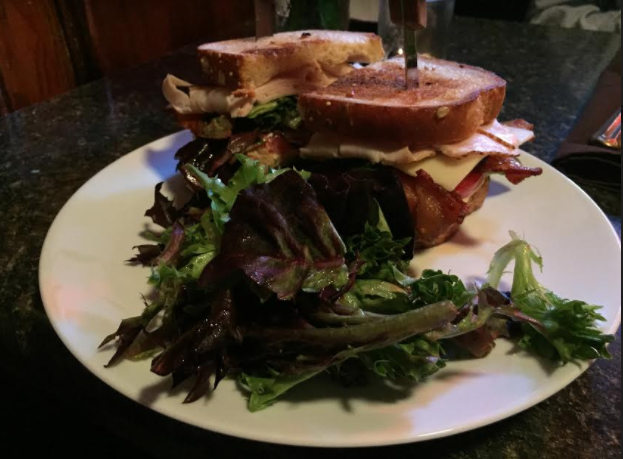 During our visit to Red Wing, Minnesota, we had some time to try several eateries and enjoyed each of them! Red Wing has a nice selection of restaurants thus adding to its appeal as a great long weekend getaway! 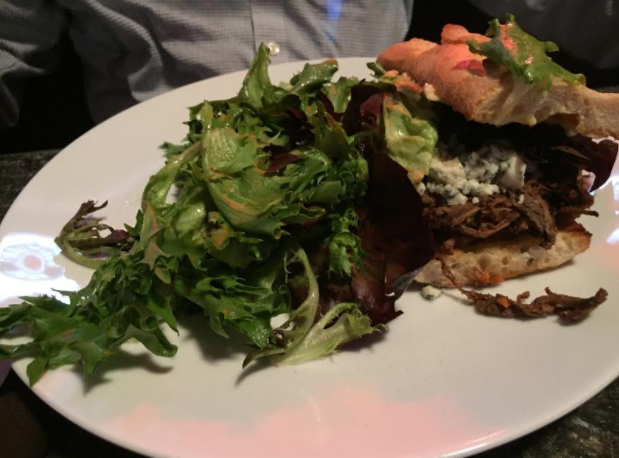 Our first evening in Red Wing, we tried Staghead which is a gastropub. The interior is quite cozy with lovely brick walls. We visited on a Friday evening and enjoyed some live music. We each savored a sandwich. The menu is certainly intriguing and one that we would love to explore more in the future. I ordered the Chickpea Burger which was AMAZING! 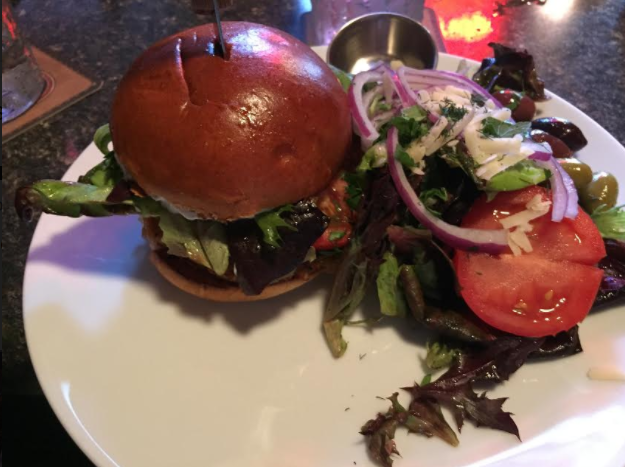 The burger was delicious and I was totally impressed by all of the vibrant veggies in the accompanying salad. My daughter had the club which was ENORMOUS! I honestly think it could have fed all three of us maybe with an additional side. My husband ordered a special -- a French dip -- always one of his favorites and this one did not disappoint! When we were shopping afterwards, locals recognized our takeout boxes. Yes, they love Staghead, too! While in Red Wing, we also visited Hanisch Bakery & Coffee Shop which has been a local fixture since 1945. 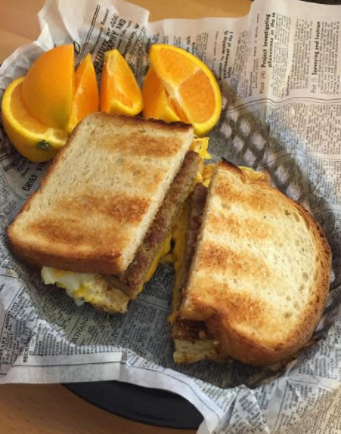 The bakery is from scratch and the coffee shop has offerings for breakfast and lunch. The shop is quite adorable with nostalgic signs and items. My daughter and I both enjoyed slices of quiche. 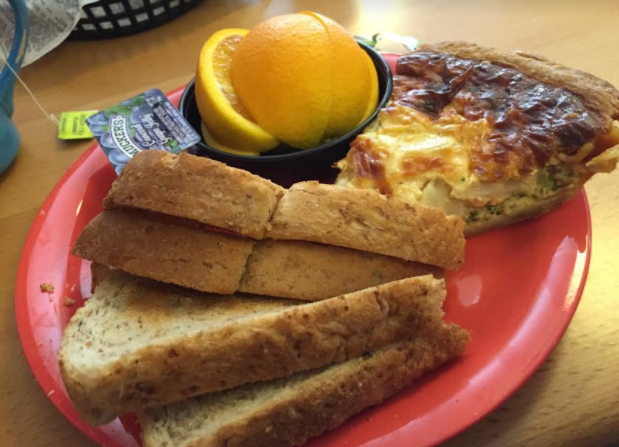 The quiche was accompanied with fresh orange. I also had a nice hot tea. My husband went with a sausage breakfast sandwich and a coffee. After, we enjoyed treats from the bakery. They truly had an amazing selection! I tried to snap a photo but it was pretty busy -- a testament to the from scratch baking! We benefited from fantastic sunny weather while in Red Wing. Thus, one evening was the perfect time to capitalize on the outdoor dining available at The Veranda in the historic St. James Hotel. 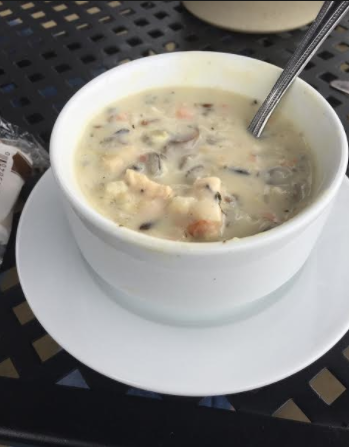 I enjoyed a cup of the St. James Wild Rice Soup. The soup is quite tasty -- I highly recommend it! 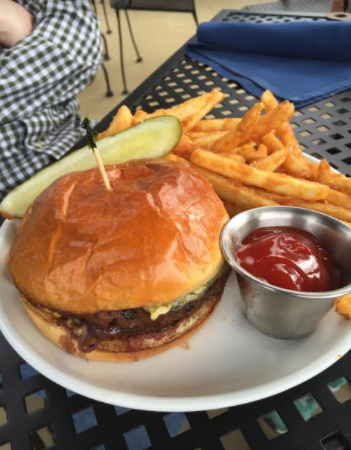 My husband enjoyed a burger and fries. The fries were quite addictive! My daughter went with a flatbread. 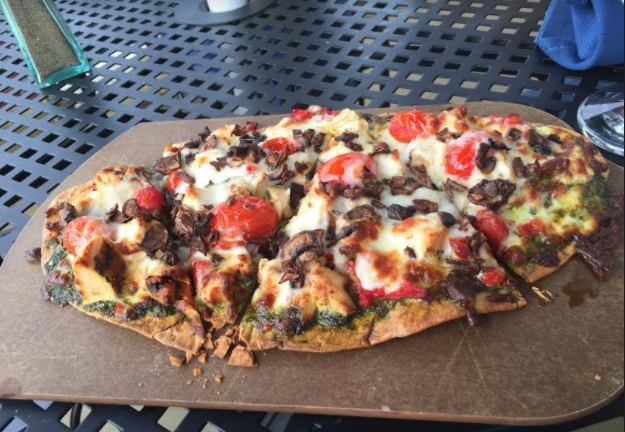 We were surprised by its size and the great covering of toppings. The St. James Hotel opened in 1875. While you are there, explore and enjoy the historic features like the lovely library! As you can see, we quite enjoyed our eats in Red Wing! Great places to keep hungry travelers happy! This was so fun to read. I've passed through Red Wing but always wanted to spend more time there.